Earth Day celebration at Stinson Beach on Sunday, April 22, 10 am–3 pm. Photo: Marco Sanchez. Earth Day 2019 takes place on Monday, April 22. It’s a great time to celebrate and teach our children the importance of preserving our planet’s resources. Families will find plenty of ways to observe the occasion here in Marin and the Bay Area, and we've created a list of local Earth Day events, volunteer opportunities, or ways to celebrate nature and the planet. All ages welcome. Volunteer with us from 9:00am - noon to help remove invasive plants and repair split rail fencing. After the volunteer work day, join us from 9:00am - 3:00pm at our Open House! 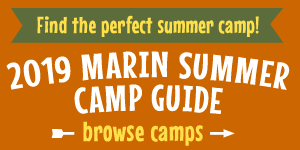 This family friendly event welcomes you to learn more about China Camp State Park. Activities include: Spanish language bird watching hike with naturalist Marco Berger (9:30am), all ages exploration of the Turtle Back nature trail with Sarah Ferner from National Estuarine Research Reserve (10:30am), Chinese Games, museum tours, wildflower walks, soccer relays (ages 6 and up), scavenger hunts, arts and crafts, and more! All ages welcome (volunteers ages 17 and younger must bring a waiver signed by a legal guardian). Please register here. Event details. Our third grade Ocean Warriors are hosting a Clean Up in celebration of Earth Week! We are inviting everyone to McNears Beach (North of the pool) to help clean the beach and enjoy activities including: Micro-Classes on Tidal Ecology, Plastic Pollution, Naturalist Talk, Mindfulness, Water, and Habitat Restoration. More activities to come! :) RSVP please! Location: 201 Cantera Way, San Rafel. Event details. Come experience the national parks! On four days in 2019, all National Park Service sites that charge an entrance fee will offer free admission to everyone. Event details. Celebrate Earth Day by creating art on the beach! Join in as community members, professional artists, and passers-by construct sculpture using sand, rocks, shells, seaweed and other beach treasures. The event starts with beach cleanup (bags and gloves supplied). Event details. Santa Rosa’s annual Earth Day festival is a FREE, family-friendly event that brings the community together through live performances On Stage, local and earth friendly products, and eco-friendly crafts and activities for kids. Celebrate the Earth with great people, local food, beer, and wine! Location: Courthouse Square, 25 Old Courthouse Square, Santa Rosa. Event details.